Jesus promises that through prayer, you will receive exactly what you ask for. Prayers are not answered. First let’s review the promises and then the proof that they are not answered. Here are the powerful words of Jesus that promise your prayers will be answered just as you ask. The full verse and citation can be found below. I tell you the truth … you will receive whatever you ask for in prayer. … ye shall ask what ye will, and it shall be done unto you. … believe that you have received it, and it will be yours. For truly I say to you …nothing will be impossible to you. … they will lay their hands on the sick, and they will recover. Those statements are unequivocal. Jesus placed no conditions on these promises other than that one believed (in God, the father; not in Jesus’ resurrection obviously… he wasn’t even dead yet) and had faith (in God, the father; not in Jesus’ resurrection obviously… he wasn’t even dead yet). He did not say that …. your prayer will be answered if it is God’s will. your prayer will be answered at a later time. your prayer will be answered but you may not like the answer. your prayer will be answered but you may not know it. Jesus promises to give you what you ask. The only condition for receiving “whatever you ask for” is that you have faith (in God, the father; not in Jesus’ resurrection obviously… he wasn’t even dead yet) and do not doubt. There are no other conditions. He says you will receive “WHATEVER/ ANYTHING ” you ask. No amputee has ever had a limb spontaneously restored. No child born with a birth defect e.g. cleft palate, has ever had it spontaneously disappear after prayer. No child born with downs syndrome has ever spontaneously recovered after prayer. No one who has been officially declared dead has ever come back to life after prayer. No schizophrenic has ever been spontaneously restored to normalcy after a prayer. No one who is totally blind/deaf has ever spontaneously recovered his/her sight/hearing after a prayer. No one diagnosed with Parkinson’s Disease, Huntington’s Disease, or numerous other deadly diseases have ever been spontaneously cured after a prayer. There are a whole lot of doctors in this world; none would be necessary if prayer worked. If we know about these trivial nonsense “miracles”, we would certainly know about real miracles such as those listed above. A bona fide miracle would cause headlines in all newspapers all over the world. There would be before-and-after pictures, numerous appearances on religious TV stations, YouTube, etc. One of these alleged miracles, Our Lady of Lourdes, has millions of visitors a year based merely on a 14 year old’s claim that Mary appeared to her. Isn’t it sad that these “miracles” are devoid of anything more significant than apparitions, stigmatas, and bleeding statues? Who cares? What proof of God’s desire to intervene in a person’s life are these 10 “miracles”? Here are the verses where Jesus promises that prayer will work for you. Jesus places no conditions on these promises other than that one believes and has faith. In fact, Jesus prefaces some of them with words that accentuate the veracity of the words to follow; e.g. “Truly I say to you”, Truly, truly I say to you”, “I tell you the truth”, etc. John’s “quotes” from Jesus are different from the other Gospels. Here we have a total switch in the responsible person. Jesus does now say that answered prayer does require belief in him, Jesus. James is back to requiring that you have faith in God, the father, that HE, the Lord may give it to you. There are no external writings telling about about multitudes of sick people who recovered after prayer. We only read, IN THE BIBLE, that Jesus healed a few who happened to be in his vicinity. Why didn’t he heal all lepers all over the world? Hmm? He allegedly had the power to do so. Christians can create amazing excuses when confronted with the reality of unanswered prayer. But there is one that cannot be danced around. That is the prayer that promises to heal the sick. Once the prayed for person has died of the disease the prayer was intended to prevent, it is obvious that the prayer of faith DID NOT cause the patient to “recover”! “Recover”, Jesus said “thy will recover”. There can be no equivocation about what that phrase means. It means…”they will recover”. Did Jesus Really Say That? (Mark 16:17-18)? Since Mark wrote 40 years after Jesus death, the probability of Jesus having said those exact words is zero. More convincingly, however if Jesus really said “lay hands on the sick, and they will recover” (or drink deadly things), then people would have tried to heal their sick loved ones. After the sick failed to recover, Jesus would have been stoned as a false prophet. He would have been exposed as the charismatic nomadic preacher that he was. HE WOULD HAVE BEEN KILLED! Get it? If you disagree, let’s hear what you have to say. No room for equivocation there is there! WHATSOEVER YE SHALL ASK IN PRAYER, BELIEVING, YE SHALL RECEIVE. Here again, we have the case that it would have been easy to expose Jesus as a false prophet. Again he would have been stoned. In the links below, we have two prayers we would like a believer to pray for us. Please Note: It doesn’t seem to us that prayers are truly answerable by an omniscient God because he would have already envisioned the concrete results of the future. Prayers are asking Him to change what he knew would happen. Praying for someone does nothing to the person prayed for. The prayer satisfies your ego, gives you the impression that you have done something for that person. In reality you have done absolutely nothing. Your help is equal to zero. From a point of “quantum theory” – with a flavour of spiritual ideology from Buddhism – “prayer” – in its simplest “context” – is “shaping reality”. Another way of stating such is with “Dharma” – or “karma”…as illustrated via “The Law of Attraction” (“The Secret” is a fair illustration of such). With all of that as “context”, prayer – in the form as described, functions extremely well. Outside of that – such as the ideology of “wish lists” or “Santa’s Lists to God” – that is myth, that is lie and illusion, that is false hope – and, obviously – a complete waste of time and energy. I myself is an evidence, my prayers are being answered. God hasn’t given me any bribe to say this. I say this because I know God exist for real and He is Jesus. The verses in the Bible concerning prayer are very specific and unambiguous. If people are supposed to be able to take John 3:16 at face-value, then all the verses concerning prayer should also have that same status, right? If prayer actually worked as stated in the Bible, you would think that every single disease known to man would have been prayed into extinction long ago. Not only that, but you would physically experience differences between “believers” and those of us who actually know the difference between fairy tales and truth. You would see believers living healthier lives; they would not need insurance or doctors and they would not experience tragedies that us “heathens” experience. Laws of physics and probability would be violated regularly as the believers’ prayers were being answered. What you see in the real world is, prayer holds no more weight than walking under a ladder or breaking a mirror. Believers do not live longer than the rest of us. They suffer from the same ailments and genetic defects that the rest of the world experiences. There are no “answered prayers” without coincidence. A simple example is this: you pray for a mustard stain to be removed from your favorite shirt. Then you use detergent on it and throw it in the washing machine. The stain is gone….prayer answered! If you prayed over the shirt and the stain vanished before your eyes, without any additional effort from you, then THAT would be an answered prayer. When you throw it in the washer (like us heathens do), you can’t say divine intervention was involved. My stains go away and I laugh at the thought of prayer. That’s a simple example, but it can be applied to anything; just substitute the stained shirt and washing machine for anything else (a cancer patient and chemotherapy, etc.). No prayers are answered without “outside help,” which means they really aren’t answered prayers at all. Prayer is not some kind of telepathic, special communication with some being in outer space. It’s superstition and it has zero effect on life, period. It does NOTHING. You are talking to yourself, and answering yourself in return. Nothing more. Prove me wrong: 1 million believers can form a prayer circle (that should guarantee that there are at least some true believers in the group). Then pray that God cures all cancer victims tonight, erasing all forms of cancer from humanity forever. I can already tell you that this prayer, or any like it will NEVER be answered. Believers will do some serious dancing to explain why it’s not answered but the bible states very clearly that it WILL be answered. That’s a contradiction and solid proof that prayer does not work. you keep mentioning faith as condition for a prayer to be answered but then how can you measure ones faith? truly, only God can and he Has over time and several answered prayers of those with great faith. It is the Bible that mentions faith as a condition for prayer to be answered. What prayers “of those with great faith” has God answered? 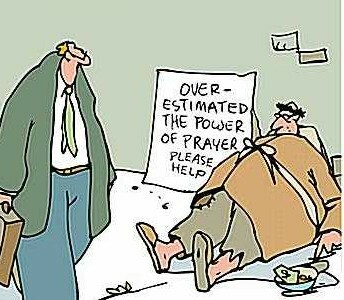 Can you prove that the outcome wouldn’t have come about anyway without prayer? Can you show a case where there is no room for doubt – an amputated limb restored for example; or a loved one resurrected after having been dead for a week or more? Both of these situations are possible according to the words in the Bible. So where did the idea that one has to have great faith come from? Jesus said that your faith had to be no larger than the size of a mustard seed, remember?! The fact of the matter is that there is no such thing as an answered prayer! As someone once said if prayer works then why are there doctors?